Place the almond paste in the bowl of a mixer fitted with a paddle and beat it on medium speed to break up and soften the paste. Add the salt and granulated sugar. Beat on medium speed for about 5 minutes to ‘’cream’’ it and take away the granularity of the sugar. Add in the confectioners’ sugar a little at a time and mix thoroughly. Then add the egg whites, one at a time, until fully incorporated. It should look like a thick batter, not a cookie dough. Scoop the batter into a pastry bag with a medium to large plain tip. Line a sheet pan with parchment. Pipe the batter onto the parchment, in 1 ½ -inch disks. 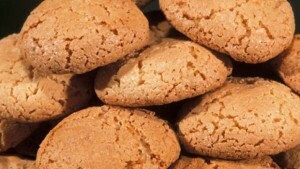 (You can space them about 1 inch apart, as these cookies do not spread much.) Alternatively, you may spoon them on instead, taking a tablespoon-size soup spoon and scraping the batter from the spoon onto the parchment with a second spoon. This works fine through the cookie will have a less smooth surface. Bake for 12 to 15 minutes or until golden. Let them cool on the pan for 5 minutes. Then, lift the corner of the parchment and carefully pour about ¼ cup of water underneath the parchment (between the sheet pan and the parchment). You can tip the pan so that the water runs to all parts of the pan, then let it sit and cool another 5 or 10 minutes. This allows you to release the cookie, which is still moist in the middle, from the parchment, instead of tearing the bottom off. Just be sure the water stays under the parchment and not on the baked cookie.